House and time at Malvern: No 4, 1894 - 1898. Died: 12 October 1918 aged 38 in United Kingdom. Died of pneumonia after gas poisoning. Son of Michael Longridge, Linkvretten, Bowdon, Cheshire, b. 1880. Shell—Remove. School Prefect. House XI Football. Trinity College, Cambridge; B.A. 1905; ordained 1906; Curate of St. John, Bethnal Green, 1906; Elland 1907; St. Peter, Coventry, 1908; St. James, Exeter, 1909; Clyst St. George 1911. Great War, C.F. (overseas). Army Chaplains' Department. Died at Topsham of gas poisoning, October 12, 1918. Husband of Constance Longridge, of 2, Clystlands, Topsham. 'If, intellectually, less prominent than his elder brothers, Archie Longridge was a boy of more than average ability, to which, perhaps, he hardly did justice at School. He impressed himself chiefly upon those who knew him best by his charm of spontaneity, the expression of a nature which responded quickly to environment. Though he wavered in the choice of a profession, in his final decision to take Holy Orders he followed the ideal of social service, which had been the main purpose of his boyhood. He was full of ideas, and in his clerical work developed considerable literary power. He offered himself as a Chaplain for service in the war, and was for two years and a half in France, and afterwards, when invalided home, for nearly a year at Grantham. While on leave at Topsham he contracted influenza, and died, on October I2th, of pneumonia, rendered fatal by the effects of German gas.' (Malvernian, Feb 1919). "Death of the Rev. A. O. C. Longridge, M.A., at Topsham. It is with regret we announce the death of Rev. A. O. C. Longridge, M.A., formerly Assistant Diocesan Missioner for Exeter, and at the same time curate of Clyst St. George, near Topsham. In May, 1915, he went to France as chaplain, and served there two and a half years. Being gassed, he was invalided home at the beginning of the year. He subsequently became chaplain to the R.A.F. at Grantham. He came home recently to visit his wife and family at Topsham, Mrs. Longridge being down with influenza. The rev. 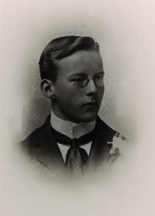 gentleman contracted influenza while on the visit, and pneumonia supervening, he succumbed, at the age of 38 years."